What is the Position of the Honorary National President? Girl Scouts of the USA’s Honorary National President post is a tradition that dates back almost 100 years. By accepting the position in 2009, First Lady Michelle Obama joined the ranks of every First Lady since 1917, when First Lady Edith B. Wilson became the first Honorary National President of the Girl Scout Movement. 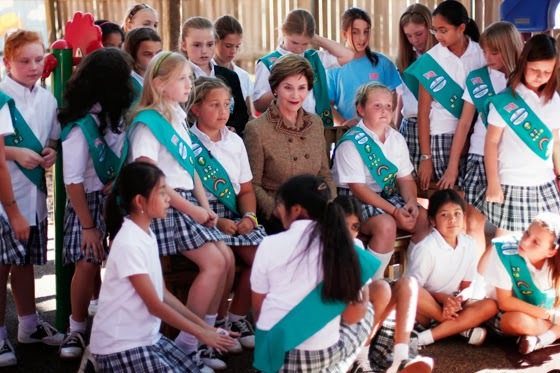 In her tenure as Girl Scouts of the USA's Honorary National President, First Lady Laura Bush celebrated the 90th anniversary of Girl Scouts of the USA. She also remained engaged in Girl Scouting through the 100th Anniversary, even filming the below video. Girl Scouts of the USA is proud to have First Lady Michelle Obama help with our recruitment efforts. In a video released this week, Mrs. Obama highlights the important role played by Girl Scout volunteers, coinciding with the launch of the organization’s new national campaign to increase recruitment of girl members and adult volunteers. The “I can’t wait to…” campaign highlights the fun, excitement, and anticipation that are part of the Girl Scout experience.